During the past two decades, cities have become nerve centers for the production of value. Connected in real time by means of a vast infrastructure network, their productive dynamic has surpassed the organizational and management capabilities of territorially limited States, which are dependent on the international financial flow of capital moving across them. Given that cities are truly the biopolitical factories of the 21st century, the job functions of an urban planner are now identified with those of a highly placed manager in charge of a company’s R+D+i, and the mode of governance applied to these is different from that used during previous, historic stages. From different viewpoints (Philosophy, Law, Architecture, and Engineering), this book offers an analysis of the main changes which have taken place in the way cities function. Among other issues, it looks at the management styles applied by public administrations to public spaces (David Thunder; Jorge León, Enrique Cano, and José María Castejón), and the new manner in which social (Julia Urabayen) and legal – public (Adriana Ruiz and Alejandro Gómez) and private (Felipe Schwember) – segregation is generated. It also looks at the new sociopolitical uses that city inhabitants have given to common spaces beyond the dichotomy of private and public space (Jonas Holst; Carlos Cámara). In other words, the chapters included in this book are not an historical approach to the city, but a theoretical reflection on the disciplines that define our post-metropolitan cities. 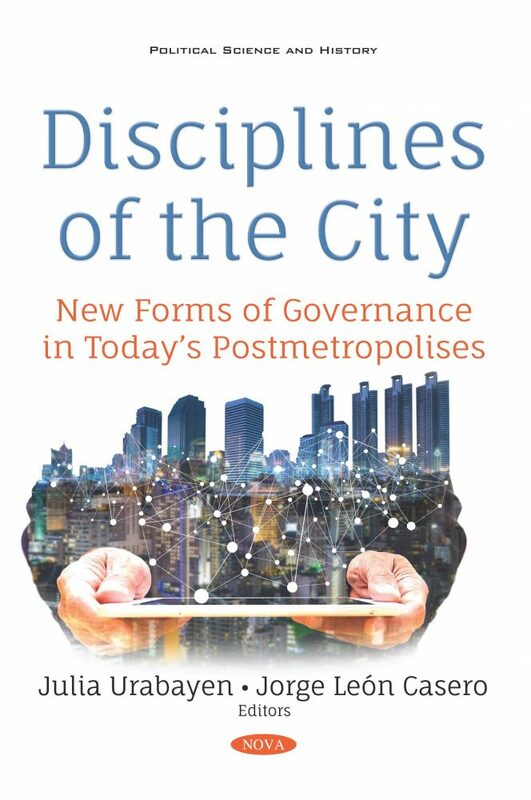 The aim of the book is to understand how cities and the disciplines that are used to make them work function nowadays: governance, politics, and technology. The cities of the 21st century are no longer places where people can live freely (as Weber stated in The City), but spaces divided in at least two different areas: those who have access to ICT and those who do not have that technology, those who live in healthy and safe boroughs, and those who live in poor und unhealthy areas. This book ponders those problems and tries to show how the disciplinarians of the city deal with them. There are two main readerships for the proposed publication. The first one is professors and researchers who work in the fields of Political Philosophy, Law, Urban Planning, Politics and Social Sciences. It is also addressed to students of those fields and to anyone who is interested in knowing how cities function nowadays. The academic level of this readership is scholars and researchers, but also cultured people who do not belong to the world of academe. The other main readership is any group of professionals devoted to city management: Urban Planners, Public Administration and people who work in Urban Regeneration. Cultured people who want to understand the world they live in. Public Administration professionals and Civil Servants. Jobs related to Urban Regeneration: Architects, Social Workers, social movements or civil societies.